Took the R to the track today. 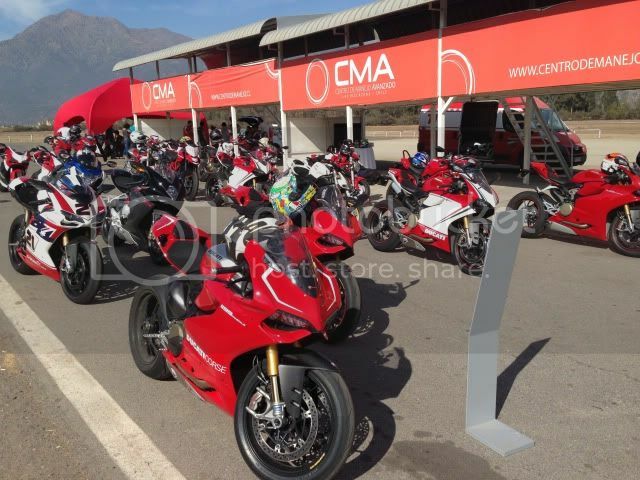 Ducati Chile had a track day event for their customers and future customers. Only three bikes with other brands were allowed at the event. GSXR100, Brutale and F3. The R behaved a bit different than my S at the same track. Loved the engine though! but everything else felt a bit foreign. Maybe I need to get used to the machine. No lap time was kept because the event was "friendly" but the bike felt faster than my old S, nonetheless. Passing another rider is the only way to get bragging rights. Biggest difference I noticed with the R and the S... definitely have to keep the traction control in the lower range because acceleration out of the turns kept the DTC busy... almost too abrupt. Started with stock setting of 5 then brought it down to 3 then to 1. At setting 5, there were abrupt cut offs from 2nd and 3rd gear. My suspicion... I think the new sprocket and faster revving engine makes the R wheelie more out of corners and the difference in wheel speed when the front wheel is up kept cutting fuel off in the lower gears, in higher DTC settings. Any inputs on this? Last edited by ddd269; Apr 28th 2013 at 05:03 PM. thanks for sharing your experience in the track with the R.
how was the R seat?? did you have other seat on your S? I am not sure about the DTS. Hopefully someone can answer. I swapped out the R seat to the DP race seat. I had the DP race seat on the S as well. I highly recommend it. Very grippy and comfortable. 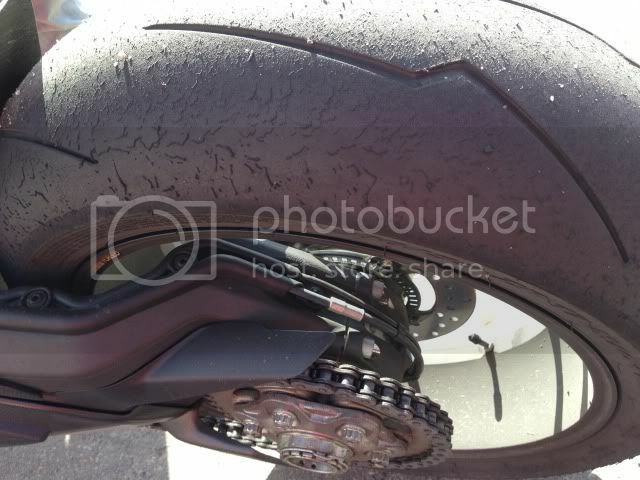 The tire pressure was set by the Ducati mechanics before the track event... I think the rear were set at 30 or 32 cold. Can't remember. I set the rear suspension at 16 compression and 15 rebound (softer than stock by 2 setting, I think) if I recall correctly. I'm horrible at remembering these things. I run 29psi front and rear cold, and have great traction and tire wear. I have only ran the stock settings in the DES, have not played with it yet. Somehow the stock suspension setting on the R seems "harder" than what I remember with the S. I had to turn the settings down 1~2 settings down to get it to what I was used to with the S. Both bikes had about the same amount of CF accessories and full Termi, and should weigh the same, so I don't know what the difference is. 30 PSI cold is too hot for the rear on the track. If the pressures are too high its going to want to spin up the rear. I set mine at 27-28 hot off the warmers before I hit the track and I'm getting great wear and traction. Tire pressure imo is never one number universally. 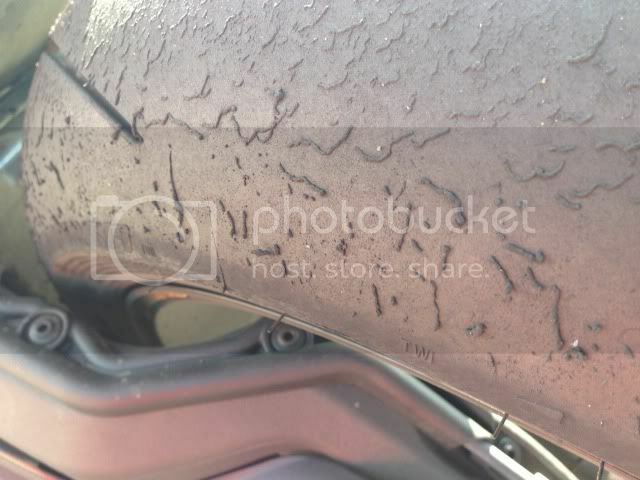 If I am in the middle of the summer where the track is already in the 80-90 degree range I run a lower pressure but often when the day starts out and I ride at a track in a high elevation area I run a higher pressure as the tire will simply not get the heat in it needed. I'd be surprised if the Ducati techs didn't take that into consideration. Chili being a land of varied elevations, and terrains, everything from the Andes to desert would have been factors to consider. IIRC Chile is more mountain than anything - 70-80%. Such a strong showing. Glad to see such diversity at the track. I see a Hyper as well as a Multi lurking back there. Yup... There are 2 different groups. Mostly divided by superbikes, and the rest such as hyper, mts and the street models (monsters, streetfighters, etc). If you ride a superbike as a beginner, you can run with the "slower" groups.